Ophthalmology versus Psychiatry Part 2. Spoiler Alert: Ophthalmology always wins! I was driving home last Friday night and for several minutes it seemed like there was a bug in my right eye. I did the upper lid over lower lid trick a couple of times and that didn't work so I pulled over and tried to rinse it out with artificial tears. No change at all with that maneuver and then I started to see familiar floaters and small black dots in my visual field but only on the right. I had the exact same symptoms a year ago that led to a diagnosis of a vitreous detachment with no retinal problems. Later that night I started to see flashing halos in the upper right visual field. I got in to see an optometrist through my health plan and was referred immediately to a vitreous and retinal specialist today. At a about 2PM today, I had a laser surgery procedure to fix a small retinal tear in the periphery of my right retina. The specialist explained pathophysiology, the rationale and the expected success rate. 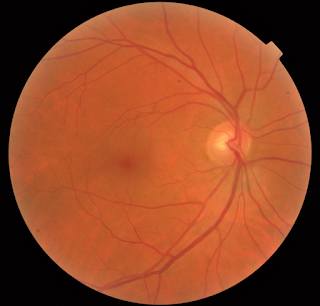 There is age-dependent liquefaction of the vitreous humor and in that process it can pull away from the retina. That process can be benign like it was for me a year ago or it can lead to a "traction-event" on the retina and cause a tear. The main reason for the laser surgery is to spot weld the tear by forming a photcoagulation scar where the laser hits and prevent a more extensive tear that could require open surgery of the eye and the risk of infection and further vision loss. The decision for the laser surgery was an easy one, especially because I have known many people who required variations of the open surgery. I sat in an ophthalmology exam chair with my head in a fixed position. This video illustrates the exact procedure that I underwent today. The laser light was green and at the end of the procedure I was completely blind in the eye for about 10 minutes and then transitioned to a violet vision and then back to normal. This phenomenon is cause by saturation of the photoreceptors by laser light. The procedure I underwent was much faster with repeated pulses of the laser. If I had to estimate, I would say about 150-200 pulses of light were used. The specialist kept me posted: "30% done.... 50% done, etc)" and also coached me on how I was doing focused on the extreme limits of my visual field. I had some observations about ophthalmology and orthopedic surgery last year and this year is no different. First, I am amazed at how many of these vitreous retina specialists exist across the country. Given my previous estimate of the total number of ophthalmologists and the numbers of people that they treat, the distribution must be very good across the country. Their services are certainly in demand. Retinal and vitreous disease is clearly an age related problem. There were 15 people in the waiting area and there was one person younger than me. Most were considerably older and many were there to get injections to slow the progression of macular degeneration. I am no stranger to ophthalmologists. When I was in the 8th grade I shot myself in the eye with a BB gun and have had appointments every year to follow up on that injury. That has also allowed me to follow the way that ophthalmologists practice. Back in the 1960 to 1980s they did everything. They started out with visual acuity tests, then visual fields, the intracranial pressure by tonometry and eventually the slit lamp approach. They did the entire refraction and tried to get the visual acuity as good as possible. They proceeded to the slit lamp exam and at some point started doing retinal exams using hand held lenses and lens in conjunction with the slit lamp. If an ophthalmologist was really flying and had a patient who was able to cooperate - it might be possible to get all of this done in 20-25 minutes. Things have changed drastically since that time. I was roomed by a medical assistant who recorded the history and took my vital signs. In Room 2, I saw another medical assistant who took additional history, cursory social and family history (only eye diseases and diabetes in parents and siblings) and a cursory review of systems (have you had a heart attack or stroke? do you have chest pain today?). She did visual acuity, visual fields by confrontation, and ocular motility and recorded it in the chart. She did a slit lamp exam. She measured intraocular pressure by some kind of digital hand held tonometer that I had never seen before. She got my eyeglass prescription off the new lenses and did not need to do a refraction. In Room 3, I was introduced to a scribe who told me that she would be taking notes for the specialist. She set up twin displays with the EHR spread across. The specialist walked in and performed indirect ophthalmoscopy by both slit lamp and standing hand held lenses. He told me that I had a retinal tear and we discussed the surgery. The scribe reminded him how it needed to be worded in the chart and how she was going to record it. I electronically signed the consent form. In Room 4, I saw a person who only did retinal scans with a blue light. Finally in Room 5, the laser procedure was done. This was a significant display of efficiency in terms of division of labor with a sole focus on problems related to the eye. The social history is not that important in this case - they were only interested in marital status, offspring, and occupation. They were not really interested in a review of systems other than a more detailed review of ocular symptoms - including my history of the BB gun injury. They efficiently proceeded to laser my torn retina (at about the 45 minutes mark) and if the quoted statistics were correct - greatly reduce the likelihood or a major retinal tear and the need to open surgery or in the very worst case partial or complete blindness. Unfortunately in psychiatry we have nothing like this. I am still doing what I have done for the past 30 years - an obsessive 240 plus point interview that included a detailed history. My medical history, review of systems, social and family histories are all comprehensive and customized for the situation. If I want vital signs or some examination - I have to do it myself. In some clinics I can get checklists - but despite all of the hype about collaborative care or measurement based psychiatry those rating scales are a poor excuse for detailed questions about the problem. The people who believe they are actually using quantitative metrics to measure care with these scales are fooling themselves. In order to make up for the stunning lack of efficiency in psychiatric practice we have the workarounds of more and more prescribers - all asking their own questions and making their own diagnoses or we have the collaborative care psychiatrist advising primary care physicians on how to treat their patients based on rating scale scores or the questions of those physicians. The other limiting factor is the lack of value assigned to the psychiatric evaluation. I have not seen the bill for laser eye surgery - but I can speculate that it will be many times what I am paid for a comprehensive evaluation in roughly the same period of time that it took to diagnose and repair my retinal tear. With the division of labor, the ophthalmologist was seeing 7-8 times as many patients in an hour than I can see. To me that is both the most positive aspect of clinical psychiatry, but also its downfall. Psychiatry is too complicated to commoditize. Don't get me wrong - it happens all of the time. Very few psychiatrists who are not in private practice have the luxury of talking with people for an hour. That makes patient experiences highly variable. We have to find a model that takes us out of the 1970s but also provides more clear cut results. Ophthalmology has clearly been able to do that. Science and treatment in medicine is better with precise measurement. There is nothing about rating scales that I would call precise. With my retina and vitreous problems I have come to another conclusion. Training in Geriatric Psychiatry is designed to increase sensitivity to ageism and and biases against the elderly. I have had plenty of that training. Now that I am technically a geriatric person myself, I can speak with authority - aging is an inescapable disease. I hope someday there is a better solution. I had the opportunity to listen to Friday afternoon public radio for the first time in a while this week. I had settled into that habit a while ago when I used to take two hours off of work to go skating. As an inpatient psychiatrist, I still had to go back to work to finish so the two hours of skating time just added two hours to my Fridays. I did have the opportunity to listen to Science Friday with host Ira Flatow. When I turned it on this week, I noticed his familiar voice. He was talking with one of the correspondents who talked very briefly about the Blue Brain Project. The Blue Brain Project is an initiative in Switzerland that investigates the use of mathematical models to look at human brain function - memory in particular. What they do is generally known as computational neuroscience. It is a modern day extension of some of the blended neuroscience and artificial intelligence that I mentioned in a recent post. Their work has major implications for neuroscience, consciousness researchers, and eventually psychiatrists. I will outline one of their recent papers in order to highlight why it is so important. One of the major areas of brain science that psychiatry does a very poor job at is the area of human consciousness. Psychiatry in the clinical form seeks to describe human behaviors that are two standard deviations from the norm across a very finite number of dimensions encompassing mood states, cognition and intellectual ability, and psychotic states. Psychiatry seeks to classify all of these states with a finite (but changing) number of descriptors and it assumes that human diagnosticians can detect all of these differences based on training in how to use the criteria. There are very few objective markers. Most of the objective markers exist for conditions defined by a measurable medical disorder - like bipolar disorder secondary to a closed head injury and ample MRI scan evidence of a brain injury. The most elaborate psychiatric formulations will contain a discussion of the subjects personality and psychological adaptations. There is no psychiatric formulation that I am aware of where the unique conscious state of the individual is recognized. At some level it is implicit that despite billions of unique conscious states, psychiatrists will be able to detect and treat 200+ unique disorders with no objective tests. I certainly believe that it can be done, because I have been doing it for over 30 years. But I also believe we are missing a big part of the picture when we avoid discussions about a unique conscious state. After finding out more information about the Blue Brain Project, I pulled up a list of their researchers and searched for all of their papers on Medline. A list of my search is available under the Computational Neuroscience link below. The paper I read and studied is reference 2 below. After a brief review of previous models they build the case for algebraic topology being uniquely suited to describe both local and more extended networks. In their work they represent the network as a directed graph. Neurons are the vertices and synaptic connections ( presynaptic to post synaptic) are the edges. This network can be analyzed with graph theory and the authors provide a lot of detail about how they proceed with that analysis both in the text of the article and in the Materials and Methods section and Supplementary Material. Those section also contain clear definitions of the terms used in the text of their article. I will mention a few aspects of their analysis. They discuss the method of analyzing nodes that are all-to-all connected as cliques. If the nodes are neurons total number determines the dimension. Directed cliques are those in which information flow is unambiguous. When these directed cliques bind together and don't form a larger clique they form cavities. 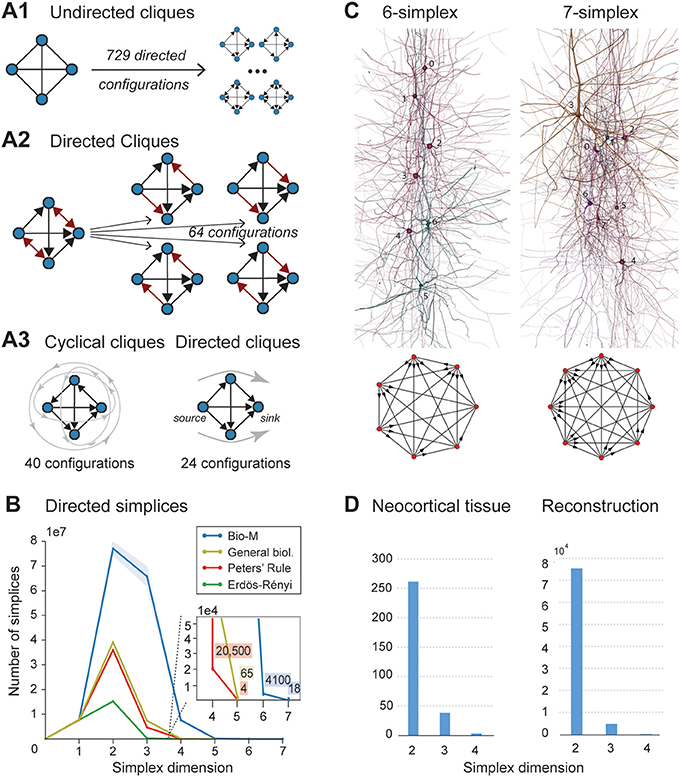 The directed cliques describe the information flow through the network and the cavities are a measure of information flow. The authors used this model in a digital reconstruction of networks in rat neocortex. They looked at a microcircuit consisting of ~31,000 neurons and ~8 million connections. In the simulation they discovered a large number of high dimensional directed cliques and cavities. Examples are included in the figure below (Figure 2 from Reference 2). A1 to A3 illustrate the authors observation that unidirected cliques in 4 fully connected neurons. This is a complicated figure because it also contains an analysis of 42 variants of the digitally reconstructed microconnectome. The reconstructions were based on cell densities, distribution of cell types, and heights of layers of the neocortex in five different rats. The reconstructions contained directed simplices of dimension 6 or 7 and very high numbers (up to 80 million of directed 3 simplices). This was the first evidence for this phenomenon in any neural network. Figure B below shows a comparison of the average models using the measurements from rat cortex (Bio-M) to control models of five Erdös-Rényi random graphs of equal size (~31,000 vertices), and a model that used the same 3-D modle as Bio-M but that used a random connectivity rule - Peters' Rule. The number of directed simplices are far greater in the Bio-M circuit. The authors also looked at the experiment in vivo by doing multi-neuron patch clamp experiments in up to 12 neurons in cortical slices of the same age used in the digital reconstruction. In that comparison (D), the distribution of the simplices in the reconstruction (left) was lower in frequency that the actual tissue (right). The authors believe that their methods and results represent "a simple powerful, parameter-free, and unambiguous mathematical framework for relating the activity of a neural network to its underlying structure, both locally (in terms of simplices) and globally (in terms of cavities formed by these simplices). The biological based models had a higher frequency of high-dimensional cliques and cavities compared with the control models illustrating the value of biological complexity in information transfer. The microcircuits investigated were actually isolated cortical circuits and there is likely more complexity due to additional connectivity. This paper and this field is very important because it seeks to describe the emergent properties of neurons and networks of neurons. Emergent properties are those that cannot be explained by basic neuroanatomy and neurophysiology but how the entire system works in real time in the living organism. The most significant unexplained emergent property is how the human brain generates a unique conscious state. That makes this a very important field for psychiatrists to be focused on. It might help us make the leap from our current knowledge of neuroanatomy and physiology to much more specific knowledge about the person sitting in front of us who we are trying to help. 1. Science Friday. Hr1: News Roundup, Climate and Coffee, Cephalopod Week. June 23, 2017. 3. Computational Neuroscience references from associates of Blue Brain Project. The above figure is used from reference 2 per their open access Creative Commons BY license. No changes were made to the original figure. This post also illustrates the importance of looking up the original research. If you listen to the description from Science Friday, I don't think it is a very accurate description of this research or how the researchers were using the term dimension. With all of the secrecy surrounding the American Health Care Act the public is being inundated with the usual health care statistics but nothing about the alternative - single payer. The public is led to believe that first Democrats and now Republicans have the solution to what is essentially an unsustainable health care plan. A neutral observer doesn't have to stand too far back to realize that designing a useful bill with a basic goal of providing universal health care by appeasing various special interest groups will produce a messy and extremely inefficient product. It is also likely that the goal of universal health care will not be achieved. There are just too many special interests standing in the way, trying to preserve their jobs, or trying to make money. Looking at the Congressional Budget Office graphic at the top of this page illustrates how this plays out in the current bill. From the top there is $834 billion taken out of Medicaid, the federal program designed to assist the poorest of Americans. Many of my patients were on Medicaid and the benefits were not great by any means. Most strikingly was the idea that if a person on Medicaid takes expensive medications they need to "spend down" or pay out of pocket for the drug even if their income is near the poverty level. That typically leaves them with a few hundred dollars a month to live on after they pay rent. Taking more money out of that system covers less people with this bare bones coverage and shifts more of the cost to the states. Since states do not currently step up and provide enough funding for reasonable health care at times - it is very unlikely that they are coming up with billions of dollar to make up from any shortage from Washington. Most do an inadequate job right now before this change. There are philosophical dimensions to the Medicaid debate that are not apparent from the CBO analysis. Medicaid covers 69 million lower income people. The expansion under the PPACA (Obamacare) was up to 14 million people mostly single adults at or below the poverty line. Many are working at low wage jobs. I heard a recent story of a man working full time for $9/hr and this expansion allowed him to finally get medical treatment and ongoing care. The political philosophy involved those who believe that able bodied people should work and buy their own insurance versus those who realize that working in the USA today does not assure enough money to do much of anything including insuring themselves. 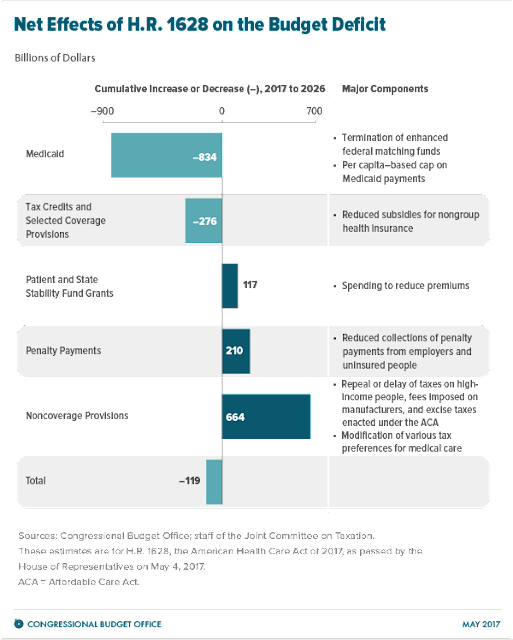 At the level of tax credits, the new Senate bill apparently leaves PPACA tax credits in place but they are worth less. There will be an adjustment for location and that typically means more politics. The whole idea behind tax credits was that insurance will be more affordable - so by definition the "savings" of $276 billion means that fewer people will be able to afford health insurance or they will need to be focused on catastrophic coverage or high-deductible plans. Let me stop right there for a minute. High deductible plans and health savings accounts (HSAs) are frequent talking points of the free market advocates for health insurance. There is very little discussion of the fact that there is no free market in American health care. Congress has essentially invented a market and loaded so much nonsense into the market that it has ballooned into over $3.2 trillion dollars. More importantly it is a recipe for the transfer of wealth from every American into a few health care and pharmaceutical companies. Politicians will talk about expenses in terms of hospitals, physicians, and drug costs but nobody is honest about the fact that all of the money is funneled into a few companies who own all of the hospitals, clinics, and doctors. Practically every piece of health care legislation is written to concentrate power into this handful of companies. In the 30 years this system has been in place - health care administrators have increased over 3,000% and we keep hearing that they cannot contain the cost of the system. How could they? They are the cost of the system. So if somebody suggests that health care is a free market tell them how it really is. The American health care system is set up to transfer as much of the wealth from the average citizen that it can under the constant threat of medical bankruptcy. High deductible plans and HSAs are just more convenient ways to do that. "CBO and JCT estimate that, in 2018, 14 million more people would be uninsured under H.R. 1628 than under current law. The increase in the number of uninsured people relative to the number projected under current law would reach 19 million in 2020 and 23 million in 2026. In 2026, an estimated 51 million people under age 65 would be uninsured, compared with 28 million who would lack insurance that year under current law. Under the legislation, a few million of those people would use tax credits to purchase policies that would not cover major medical risks." p. 4. A second consequence of the current bill is to allow waivers on a state by state basis for essential health benefits (EHBs) and waivers to allow companies to charge greater premiums based on health status unless continuous coverage can be demonstrated. The EHB is the minimum benefit set that health insurers in any state need to provide. Mental health coverage and maternity benefits are seen as the likely casualties of modified benefit sets. "CBO and JCT expect that, as a consequence, the waivers in those states would have another effect: Community-rated premiums would rise over time, and people who are less healthy (including those with preexisting or newly acquired medical conditions) would ultimately be unable to purchase comprehensive nongroup health insurance at premiums comparable to those under current law, if they could purchase it at all—despite the additional funding that would be available under H.R. 1628 to help reduce premiums." People with the highest health care costs would be unable to purchase coverage. Comprehensive coverage in many states will not contain mental health benefits. That will undoubtedly include assessment and treatment costs for substance use disorders during an ongoing opioid epidemic. Himmelstein and Woolhandler have a recent publication (2) that looks at the lives lost if the PPACA is repealed in 2018 (14,528-60,000) or 2019 (22,599-93,333) and the number saved (20,984-86,667) if the transition to single-payer occurs 2018. These glaring deficiencies in the AHCA as it stands are in both the House and Senate version and are a great example of how political biases fail to protect the majority of Americans. For those Americans who are currently protected, health care in America is designed to transfer as much money as possible into the hands of a few large health care companies and pharmaceutical companies. It has also become a jobs program for a massive influx of middle managers who have added neither value or efficiency to health care delivery. How could they - they know nothing about health care? Their job is to make money from a system that is for the most part not designed to make money. The answer to the problems with the current bill does not lie in either major party or their special interest legislature. The answer lies in a single payer healthcare system, that will provide a uniform EHB that covers psychiatric, addiction, and maternal care. That answer lies in universal access to all Americans. The answer lies in getting rid of all of the unnecessary bureaucrats and getting them jobs somewhere else. The healthcare priority right now is to come up with a system of care that will not transfer trillions of dollars from Americans to companies providing expensive low quality service. All Americans need to know that we can get the next most expensive system in the world for about $1 trillion per year less and with it nobody has to worry about medical bankruptcy. 1. Congressional Budget Office. H.R. 1628, American Health Care Act of 2017. Graphic at the top of this post is from this document and is assumed to be public domain. 2. Himmelstein DU, Woolhandler S. Trumpcare or Transformation. Am J PublicHealth. 2017 May;107(5):660-661. doi: 10.2105/AJPH.2017.303729. Epub 2017 Mar 21.PubMed PMID: 28323461. Minnesota Medical Assistance is Minnesota's Medicaid Program. It covers 700,000 low income Minnesotans. The total population of Minnesota is 5.49 million. Benzodiazepines in patients with substance use disorders: cautions, strategies, and rationale. Note: This article came out in the Psychiatric Times today as an edited version. I am posting the unedited version here to provide more details. I have not seen the printed version yet. I will add a link later to download a PDF version. For the past 30 years, there have been widely discrepant views on the use of benzodiazepines (Table 1) varying from avoiding their use entirely to moderate to high dose maintenance benzodiazepines for certain anxiety disorders. Reviews in the early 21st century suggested that high potency benzodiazepines were the preferred agents for treating anxiety disorders and panic disorder due to rapid onset of action and the fact that older low potency benzodiazepines were considered ineffective for panic disorder. These same reviews discussed the side effects due to tolerance (rebound anxiety), direct effects on memory, and dependence. Over that same time frame, treatment guidelines for treating anxiety disorders recommended shorter periods of use. Benzodiazepines are no longer regarded as first line treatment. There was a parallel evolution of thought on the addictive potential of benzodiazepines, ranging from the view that there was a low abuse potential to current observations that benzodiazepines are frequently seen being used in combination with other drugs of abuse and are commonly seen in polydrug overdose scenarios. Benzodiazepines are Schedule IV compounds and according to the Controlled Substances Act that means as a group they have a low potential for abuse. Despite that assessment alprazolam is the third most common diverted drug. Practical data of the extent of use of benzodiazepines in the population is available from the National Survey On Drug Use and Health (NSDUH) from SAMHSA. 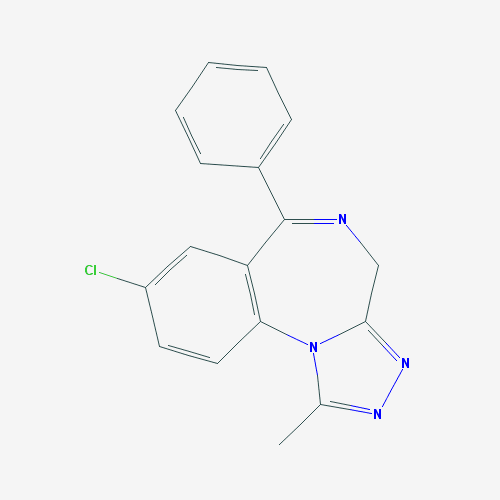 The most recent data from 2015 (1) breaks out benzodiazepine preparations from other compounds. 29.7 million people (11.2% of the population) used benzodiazepine tranquilizers. Of that group 17.6 million (6.6% of the population) used alprazolam containing products. An additional category of sedatives was designated. There were 18.6 million sedative users. Sixty percent of the sedative users used zolpidem type sedatives and this represented 11.5 million people or 4.3% of the population. 2.5 million or 0.9% of the population used benzodiazepine type sedatives. The NSDUH survey estimates the degree of misuse in addition to total use. A total of 6.1 million people were estimated to have misused sedatives. Of that group 5.5 million misused benzodiazepines and of that group 4.1 million or 1.5% of the population misused alprazolam. An additional 1.1 million people misused zolpidem products and 205,000 misused benzodiazepine sedatives. More specific estimates of misuse of individual products both in terms of total number and percentage of the population are included in the report. Survey estimates of the use and misuse of benzodiazepines do not give any measure of morbidity or mortality. Some of those measures are available from pharmacovigilance projects. A project over 6 years in England and Wales reported that in the group of patients that sustained severe harm or death from medication related incidents, benzodiazepines ranked sixth after opioids, antibiotics, warfarin, heparin, and insulin (2). A recent report by the Centers For Disease Control (CDC), analyzed the drugs most frequently involved in overdoses between the years 2010-2014 (3). Two of the top ten drugs involved in overdoses were the benzodiazepines diazepam and alprazolam. In the deaths involving diazepam and alprazolam 95% involved the use of concomitant drugs. In the US, 30% of fatal opioid overdoses involve benzodiazepines (4). The CDC and the FDA developed the Prescription Behavior Surveillance System (PBSS) to look at the trends in the prescriptions of controlled substances (5). The PBSS categorizes all of the data into three categories: benzodiazepines, stimulants, and opioid analgesics. Zolpidem is classified in a miscellaneous category rather than with the benzodiazepines. In the system, benzodiazepine prescribing rates were noted to vary from 324.3 to 580.7 prescriptions per 1,000 residents. The highest rates occurred in the patient segment that was 65 years of age or greater. The number of overlapping days of treatment between benzodiazepines and opioids varied from 11.7 to 19.3. The study illustrates common problems in benzodiazepine prescribing to geriatric patients and patients being maintained on opioids as well as the benefits of a pharmacovigilance system. Guidelines on benzodiazepine use have evolved over the years. A series of texts like Principles and Practice of Psychopharmacology (6) provides some idea of the authors conclusions in reviewing the literature in the updates from the publication dates ranging from 1993 to 2011. The authors of this text provide an algorithmic summary for anxiety disorders based on severity and chronicity. In examining their successive chapters on the treatment of panic disorder, benzodiazepines were reserved for inadequate response to behavior therapy, selective serotonin reuptake inhibitor (SSRI) plus behavior therapy, or tricyclic antidepressants (TCA) and behavior therapy. At that point the initial recommendation was alprazolam/clonazepam. If the entry point into the algorithm was at the severe level the authors recommended alprazolam plus TCA or SSRI for the first month or if that was insufficient “indefinite” alprazolam. There are additional therapies with or without benzodiazepines if that level of treatment is inadequate. By the second edition, clonazepam was added to the algorithm as another option for refractory anxiety. In subsequent editions, other antidepressant (venlafaxine, TCA), alprazolam XR, serotonin and norepinephrine reuptake inhibitors (SNRI), and anticonvulsant (valproate, gabapentin) were all factored in at decision points. The basic position on benzodiazepines has been unaltered – limited use for the first month until the SSRI starts to work is preferred unless there is insufficient response and in that case benzodiazepines are added at the level of various therapies as maintenance therapy for insufficient response. Other opinions are available from specialty texts on the treatment of anxiety disorders. One of these sources on the treatment of panic disorder (7), echoes the Janicak, et al text by listing SSRI and SNRI antidepressants with cognitive behavioral therapy as first line treatment. Benzodiazepines are listed as treatment for refractory cases with a long list of other options. Standard psychiatric references do not list benzodiazepines a first line treatment for anxiety disorders. Using the example of generalized anxiety disorder, typical problems described include the need for frequent dosing, rebound anxiety, difficulty transitioning off the medication, inability to address comorbid depressive states and cognitive side effects (8). One property is not mentioned in non-addiction literature is that in a subgroup of patients, benzodiazepines will reinforce their own self administration. That can occur in a number of ways. Some patients will notice either a euphorigenic or calming effect that is reinforcing. If the calming effect occurs in the case of social anxiety disorder both the effect of the drug and the secondary effects of social affiliation will be reinforcing. In the case of patients with phobias, the medication can take on a magical talisman effect and a person may find it difficult to confront the feared situation. The medication needs to be in their possession whether they take it or not. These are all important but understudied aspects of the behavioral pharmacology of benzodiazepines. An additional consideration in the use of benzodiazepines is the problem of chronic use. Most anxiety disorders are chronic conditions. Some studies show that subgroups will require pharmacotherapy for only a part of the time at intervals after the initial diagnosis. There is no objective guidance on who should receive indefinite maintenance therapy and it is a decision that is complicated by several potential problems. Short term tolerance and dose escalation can occur. The behavioral pharmacology issues previously mentioned can be part of the dose escalation and complicate a plan for stopping them at any point. Benzodiazepines also complicate the use of other medications most notably opioids. Social drinking can be a problem if a person is maintained on benzodiazepines. There has been increasing concern about geriatric complications including falls and cognitive impairment as any cohort on benzodiazepine treatment ages (9). There are several patterns of benzodiazepine use in addictive disorders that explain why these drugs are frequently found as secondary medications. Moderate to heavy drinkers frequently wake up in the middle of the night from withdrawal and have additional withdrawal symptoms in the morning. Benzodiazepines and sleep medications are taken to maintain sleep and treat early morning withdrawal symptoms. Opioid users use benzodiazepines to treat withdrawal. There are also several studies that suggest benzodiazepines are used to augment the effect of opioids in an attempt to create a euphorigenic effect including during methadone maintenance. Stimulant users obtain benzodiazepines to stop the continuous insomnia associated with stimulant use. One groups uses intoxicants primarily for their amnestic effect and can use benzodiazepines and a number of other agents to induce and intoxication delirium and escape perceived stressors. In each of these scenarios it is important to assess the person for secondary use of benzodiazepines and discuss the high risk that is created. Despite the long-term concerns and behavioral pharmacology related concerns about benzodiazepines, they are indispensable medications in a number of situations. They have been first line medications for catatonia in inpatient settings and greatly reduce the morbidity associated with that condition. They are used in inpatient settings for treating acute agitation associated with manic and psychotic states. They are also used for various forms of anesthesia. Benzodiazepines are the preferred medications for detoxification from alcohol and sedative hypnotic drugs due to their wide safety margin in acute dosing. There is no doubt that in a supervised setting these medications can clearly be the preferred agents for some conditions. As a quality concern, length of stay considerations play an important part in these uses because the inpatient physician may find that their patient is being discharged before the benzodiazepine can be tapered and discontinued. In that case, a plan needs to be developed if it is clear that the patient cannot take the medication in a controlled manner. Table 2. Lists a number of applications in patients with substance use problems. From a purely diagnostic perspective the treatment of substance use disorders (SUD) complicates the assessment and treatment of co-occurring psychiatric disorders at several levels. The comorbidity of anxiety and depression with substance use disorder is high. A recent study (10) looking at pooled odds ratios (OR) across carefully selected studies showed strong associations for both alcohol dependence ( OR 3.094, 95% CI 2.377-4.027) and drug dependence (4.825, 95% CI 3.013-7.725) with major depression. For any anxiety disorders, the associations were alcohol dependence ( OR 2.532, 95% CI 2.243-2.859) and drug dependence (OR 4.194, 95% CI 3.447-5.104). A more recent study (11 ) looking at DSM-5 criteria for 12-month drug use disorders found associations with bipolar 1 disorder, dysthymia, major depressive disorder and posttraumatic stress disorder. Looking at lifetime estimates added additional associations with anxiety disorders including generalized anxiety disorders, panic disorder, and social phobia. These studies are generally based on cross sectional survey data and have limitation in terms of data collection. The critical aspect of care is being able to differentiate primary psychiatric disorders from intoxication, withdrawal, and induced states and whether treating clearly defined co-occurring disorders makes a difference in outcome. In a review that looked at the issue of treating co-occurring mood disorders and substance use disorders, the authors conclude that while mood stabilization is possible, it does not lead to decreased substance use (12). A typical flow diagram of how diagnosis might proceed in patients with co-occurring disorders is illustrated in Figure 1. There is very little literature on treating the demarcated disorders and in clinical practice intoxication, withdrawal, and substance induced states may be difficult to determine in an outpatient setting. There are a number of problematic scenarios from a purely psychiatric perspective that are difficult to treat such as severe anxiety and bipolar disorder, chronic refractory insomnia as a primary diagnosis before any psychiatric diagnosis was established, and anxiety and depression. When these disorders occur with one of more substance use disorders and are approached in a systematic manner, the need for long term use of benzodiazepines is rare. But it can happen at a very low frequency. In my current practice, we estimate about 1 in 500 admissions to residential care for substance use disorders. One of the main problems in using benzodiazepines is that there have been no advances in their evidence-based use in populations with SUD. After it was determined that there was an addiction risk and that more potent short acting benzodiazepines presented a higher risk, not much research has been done since the 1980s and 1990s. Major guidelines for sleep (13) and substance use disorders (14) do not include guidance that is any more specific for their use than the previously mentioned guidelines for treating sleep and anxiety disorders in the context of addiction. The APA guideline cautions that it is more than 5 years old and cannot be considered to reflect “current knowledge and practice” but there has been minimal relevant clinical benzodiazepine related research since. There are guidelines available that provide a detailed discussion of how to approach the prescription and overall handling of controlled substances (15) that can be applied to benzodiazepines. This guideline contains a number of checkpoints in the system of care and assessment and treatment of the patient. The prescribing plan includes a detailed informed consent discussion, the goals and duration of treatment, the specific indication and instructions to the patient. The British National Formulary (16) also provides basic guidance on the responsibilities of the prescriber of controlled substances. The three basic areas suggested include that the drug is given for a sound medical reason, that the dose is not escalated, and that the physician does not become an “unwitting source of supply for addicts.” A structured approach to prescribing benzodiazepines may be useful but there is some evidence that there is a significant interpersonal component. A study of general practitioners (17) found that they were overwhelmed by the psychosocial problems of their patients and the prescriptions were driven by wanting to help the patient. Additional biases noted in this study were the limited availability of psychological services, personal use of benzodiazepines for stress relief, perceiving the benzodiazepine as benign, and the time constraint for counseling by the physician. In a follow-up, meta-synthesis of studies on benzodiazepine prescribing (18) some of the same authors synthesized findings from 8 qualitative studies and found very ambivalent attitudes about long term benzodiazepine prescribing. They characterized the decisions as “complex, demanding, and uncomfortable”. The decisions varied by individual physician and at times interaction between patient attributes and physician values influenced the prescribing decision. Those decisions are more complex and demanding in the setting of a substance use disorder and a patient who may be seeing the physician to get a prescription to use primarily to get intoxicated, to treat the effects of a primary addiction, or to potentiate the effects of another addictive drug. They are complicated when the original prescription was made by a different physician and the patient is asking for a refill. I have included a list of practical tips on both the interpersonal dimension and details about what can be useful in optimizing the safe prescription of benzodiazepines (Table 3) in that population. 1. Arthur Hughes, Matthew R. Williams, Rachel N. Lipari, and Jonaki Bose; RTI International: Elizabeth A. P. Copello and Larry A. Kroutil. Prescription Drug Use and Misuse in the United States: Results from the 2015 National Survey on Drug Use and Health. SAMHSA. September 2016. 2. Cousins DH, Gerrett D, Warner B. A review of medication incidents reported to the National Reporting and Learning System in England and Wales over 6 years (2005-2010). Br J Clin Pharmacol. 2012 Oct;74(4):597-604. 3. Warner M, Trinidad JP, Bastian BA, et al. Drugs most frequently involved in drug overdose deaths: United States, 2010–2014. National vital statistics reports; vol 65 no 10. Hyattsville, MD: National Center for Health Statistics. 2016. 5. Paulozzi LJ, Strickler GK, Kreiner PW, Koris CM. Controlled Substance Prescribing Patterns — Prescription Behavior Surveillance System, Eight States, 2013. Morbidity and Mortality Weekly Report (MMWR) October 16, 2015/ 64 (9): 1-14. 6. Janicak PG, Marder SR, Pavuluri MN. Principles and Practice of Psychopharmacology: 5th ed. Philadelphia, PA: Lippincott Williams & Wilkins, 2011. 7. Bandelow B, Baldwin DS. Pharmacotherapy for panic disorder. In: Stein DJ, Hollander E, Rothbaum BO, eds. Textbook of Anxiety Disorders. 2nd ed. Arlington, VA: American Psychiatric Publishing, Inc, 2010: 339-416. 8. Van Ameringen M, Mancini C, Patterson B, Simpson W, Truong C. Pharmacotherapy for generalized anxiety disorder. In: Stein DJ, Hollander E, Rothbaum BO, eds. Textbook of Anxiety Disorders. 2nd ed. Arlington, VA: American Psychiatric Publishing, Inc, 2010: 194. 10. Lai HM, Cleary M, Sitharthan T, Hunt GE. Prevalence of comorbid substance use, anxiety and mood disorders in epidemiological surveys, 1990-2014: A systematic review and meta-analysis. Drug Alcohol Depend. 2015 Sep 1;154:1-13. 11: Grant BF, Saha TD, Ruan WJ, Goldstein RB, Chou SP, Jung J, Zhang H, Smith SM, Pickering RP, Huang B, Hasin DS. Epidemiology of DSM-5 Drug Use Disorder: Results From the National Epidemiologic Survey on Alcohol and Related Conditions-III. JAMA Psychiatry. 2016 Jan;73(1):39-47. 12. Pettinati HM, O'Brien CP, Dundon WD. Current status of co-occurring mood and substance use disorders: a new therapeutic target. Am J Psychiatry. 2013 Jan;170(1):23-30. 16. British National Formulary. Published Jointly by the Pharmaceutical Press; Division of the Royal Pharmaceutical Society; 66-68 East Smithfield, London E1W 1AW, UK and BMJ Group; Tavistock Square, London, WC1H 9JK, UK; 2016: p. 9. 16. Anthierens S, Habraken H, Petrovic M, Christiaens T. The lesser evil? Initiating a benzodiazepine prescription in general practice: a qualitative study on GPs' perspectives. Scand J Prim Health Care. 2007 Dec;25(4):214-9. 1. Detoxification: Benzodiazepines remain the drugs of choice for alcohol and sedative hypnotic detoxification. Many treatment facilities have withdrawal protocols that use anticonvulsants or phenobarbital, but benzodiazepines have the widest safety margin and may address some symptoms of the withdrawal syndrome like anxiety better than non-benzodiazepine options. Benzodiazepines with long half-lives are generally preferable to other agents, but familiarity with options for patients with severe liver disease is also necessary. 2. Short term bridging to a more effective long term plan for treating anxiety or anxiety and depression: Withdrawal syndromes in patients with a chronic and complicated history of use can be more difficult to treat than textbook scenarios based on the pharmacological properties of the medications being used. In many situations, it is difficult to know if the withdrawal syndrome has been adequately treated, whether the underlying anxiety or sleep disorder is surfacing, whether there is a new substance induced disorder, or some combination of these processes. 3. Short term bridging in the case of a polypharmacy situation where alternative medications are less safe: Many of the non-benzodiazepine medications that are used to treat depression, sleep, and anxiety disorders have risk in a polypharmacy environment. A common flag is problems with cardiac conduction. In many of these situations it is best to avoid any medications that target the patient’s anxiety or insomnia but potentially complicate other problems and use benzodiazepines temporarily. 4. Acute catatonia, agitation, akathisia, transient anxiety due to brief severe stressors. In residential treatment centers that agitation is more likely associated with complex withdrawal states that include severe anxiety states. Benzodiazepines are useful medications to alleviate akathisia that can be the result of treatment with SSRIs or antipsychotic medications. 1. Severe treatment refractory insomnia. 2. Severe treatment refractory anxiety disorders including mixed anxiety and bipolar states and mixed anxiety and depressed states. 3. 1 and 2 only in situations where the abuse potential (dose escalation, multiple prescribers, additional illegal intoxicants) can be contained. 1. Avoid emotional prescribing based on the stress of the situation or patient characteristics. 2. Have a well thought out general approach to prescribing and do not deviate from that plan. 3. Be aware of how prescribing a controlled substance can affect your decision making and the relationship with the patient. 4. Maintain a conservative prescribing bias in general and especially in the case of a suspected substance use disorder based on the risks and scenarios presented here. 5. Maintain a teaching role with the patient that includes a detailed risk benefit discussion and the rational for prescribing or not prescribing the benzodiazepine. That includes an informed consent discussion of the addiction risk and how to prevent it. 6. Consult with colleagues in difficult situations and avoid professional isolation. Solicit feedback on how colleagues would make similar decisions. In group practices controlled substance prescribing can be the basis of a quality improvement initiative and process. 1. Carefully assess patients requesting treatment with benzodiazepines especially if they are new to your practice. The diagnosis being treated and the rationale needs to be clear. Reevaluating the diagnosis and response to therapy over time is equally important. 2. Consider urine toxicology in search of other drugs especially compounds that are often used with benzodiazepines (methadone, opioids, alcohol, stimulants). If a benzodiazepine is prescribed urine toxicology also confirms adherence rather than diversion. 3. Consult a prescription drug monitoring program (PDMP). Rules vary by state and some states require checking the PDMP before the prescription of any controlled substance. 4. Consult with collateral contacts who know the patient well. If the patient is in a structured environment – know the procedures for monitoring and dispensing the medication. 5. Have a clear plan and indication for the benzodiazepine including a plan for discontinuing it and discuss it with the patient at the time of the initial prescribing decision. 6. A written document on the expectations of the patient may be a good idea as an anchor point in treatment. Although treatment contracts do not necessary improve outcomes, the expectations in terms of a single prescriber, precautions, expected outcomes and what must be avoided is generally better than a rushed conversation about the same topics. That document can be a reference point for the future decisions. 7. Close monitoring is generally necessary with collateral contacts to assure that the patient is doing well and not experiencing complications from the benzodiazepine. An important consideration in the collateral information is the patient’s functional capacity on the medication. 8. Dose escalation can be an early sign of a problem, prescriptions be counted pill counts at each visit to determine the rate at which the patient is taking the medication. 9. Develop referral patterns for non-pharmacological approaches to problems that are commonly addressed by benzodiazepines like insomnia (referral to CBT for sleep) and chronic pain (pain specialist or physical therapy referrals). Here is a link to the final Psychiatric Times version of this article. I attended the Minnesota Psychiatric Society MPS spring meeting yesterday. The current American Psychiatric Association (APA) President Anita Everett, MD was there and gave a presentation on ethics. The title of her presentation was Ethical Issue Management in Team Care. The conference was focused on collaborative care and innovative ways to extend psychiatric practice out into areas where there is little to no coverage. The afternoon was dedicated to an APA sanctioned presentation called Applying the Integrated Care Approach: Practical Skills for the Consulting Psychiatrist. The central theme in Dr. Everett's presentation involved streamlining the 9 dimensions of the AMA code of ethics annotated for psychiatry to 4 dimensions from Principle of Biomedical Ethics. Those dimensions include beneficence, non-maleficence ("do no harm"), autonomy and justice. There was not a good 1:1 translation largely because in her formulation autonomy seemed to apply to patients but there was a question mark regarding physician autonomy. Some of the AMA/APA dimensions applied to two of the 4. For example, commitment to medical education was seen as applying to both beneficence and non-maleficence. Dr. Everett is a community psychiatrist and has studied various community mental health centers. She makes the distinction between simple and complex systems and how applying ethical principles to complex system. She gave some examples of how this might apply like integrated care in a medical shared ACO and meeting a patient in a coffee shop as part of an ACT team intervention. She poses the the ethical analysis as a series of questions pertaining to the 4 dimensions. The open discussion was instructive. There was a psychiatric administrator present who talked about the ethical issue of emergency department congestion. In his hospital there are 80 ED beds. There has a chronic problem with psychiatric patients stranded in the ED sometimes for days. The problem is basically a systems problem because most Minnesota acute care hospitals do not have psychiatric units, and very few (2 or 3) in the Metro area are equipped to treat patients with aggressive behavior. As a result practically all of the police and paramedic related acute admissions in a 5-county area are brought to this hospital. At the same time acute care beds in Minnesota are rationed to the point that there are fewer beds available than in practically all OECD countries including Mexico. One of the other attendees at the conference also made a statement consistent with what I have put on this blog many times: the state of Minnesota has systematically dismantled the state hospital system and came up with an inadequate secondary system that they no longer use. That participant was an expert in the state hospital system. In the meantime, individual counties have essentially eliminated supervised housing for people with severe mental illnesses. I really don't know what people expect when all of the resources to treat severe mental illnesses are rationed away and emergencies continue to happen. What occurs is a large steady state population of mentally ill people who are rooted partially on the street or in very suboptimal housing, inpatient units, the ED, or (worse case scenario) jail. In what was probably the most illogical approach to a solution, the ED reported the Psychiatry Department to the ethics committee for not solving the problem of ED congestion with psychiatric patients! The ethical conflict in this situation was discussed from the perspective of turf (ED physicians versus psychiatrists) and patient autonomy. Physician autonomy was touched on only so far as the question of whether physicians need to sacrifice autonomy for the greater good. Does the sacrifice of autonomy lead to resources to treat more people in the long run? That argument was advanced by a managed care physician-administrator. Any reader of this blog knows that I view ethics as basically political arguments. Most ethics seem relative to the political arguments that carry the day. For example if you think doctors aren't paying enough attention to costs and you are a health care administrator - make cost effective care the new definition of professionalism. In this case, it comes down to blaming psychiatrists for severely rationed services. The technical argument basically transfers blame directly away from the rationers to psychiatrists who are left with a huge problem. That ethical argument carries the compounding problem negatively impacting all of the ethical elements as outlined by Dr. Everett and leaving the psychiatrists in a totally untenable situation. It also illustrates how a dissection of a complex system - in this case the entire universe of mental health care in Minnesota - results in a ethical argument that only applies to one environment - in this case the emergency department. Even there it should be painfully obvious that these problems selectively apply to psychiatric patients. There is no backlog of patients with chest pain waiting for 2 or 3 days in the ED or being transferred to a remote hospital 200 miles away. All of the illogical approaches to psychiatric care that apply in the ED can be traced back to decisions by politicians - not the least of which is to hire managed care proxies to ration access to care. It is obvious that sacrifices in physician autonomy to managed care administrators has only made the problem far worse and not better. In the state of Minnesota. there is no justice for psychiatric patients. Anita Everett, MD, DFAPA. Ethics in complex systems of care. Minnesota Psychiatric Society Spring Scientific Meeting. June 16. 2017. There is was - plain as day on my LinkedIn feed: "Psychiatric drugs killing more users than heroin, cocaine, say health experts". Seems like a headline more fitting for one of the large antipsychiatry web sites out there. What? Addictive drugs and the current overdose situation is something that I know more than a little about. I lecture about it. I treat the addicted. I was in the medical school pharmacology classes where they taught us it is practically impossible to kill yourself with benzodiazepines unless you mix them with alcohol. Of course today we know that it is very easy to kill yourself by mixing benzodiazepines with opioids. My first problem was the characterization that benzodiazepines are psychiatric drugs when 80% of the prescriptions are from non-psychiatrists (1). This is a common tactic used to impugn monolithic psychiatry. Some authors try to link the ills of all antidepressant, antipsychotic, and mood stabilizing medication to psychiatrists. The only medication that psychiatrists prescribe more of than primary care physicians is lithium. Most primary care physicians consider lithium to be a weird little niche drug that they would prefer psychiatrists handle. For a while psychiatrists were also reluctant and prescribed a number of less effective medications. Part of that was based on hype, but I am sure there was at least a partial unconscious motivation that the burden of lithium prescribing could be avoided. The secondary argument of course is that psychiatrists are thought leaders in this area and convince the poor unthinking primary care physicians to prescribe benzodiazepines and add them to opioids! There are no Key Opinion Leaders (KOLS) advocating for the widespread use of benzodiazepines. Instead I am asked to write about reasons to avoid prescribing them. Since the entire class has been generic for some time there is no pharmaceutical marketing. No - you really don't have a leg to stand on if you are making that argument. Although antipsychiatrists don't generally have a leg to stand on - let's assume there is at least one person who is interested in the facts rather than hum-drum antipsychiatry fake news. It turns out there is actual data out there. Thoughtful analyses from both NIDA and the CDC that look at the issue of overdoses on various forms of opioids and cocaine, but also the various combinations of opioids plus either cocaine or benzodiazepines. All of the data I am posting here is available at this link. It is all public domain from employees of the US Government and they have done an excellent job with the details of the current drug epidemic. The first two slides are total death from all opioid overdoses and heroin overdoses. Looking at 2015 those numbers are 33.091 and 12,989 respectively. The next slide looks at total cocaine deaths. And in 2015 that number was 6,784. The final slide looks at benzodiazepines on their own (1,306) and benzodiazepines plus opioids (7,485). Note that concomitant benzodiazepine use with opioids is a major risk factor for death from that combination. The annual benzodiazepine deaths have remained relatively constant until the onset of the opioid epidemic. It is well known that some opioid users take benzodiazepines to enhance the effects of opioids. To recap, if the heroin deaths in 2015 were 12,989, the cocaine deaths were 6,784 and the benzodiazepine deaths were 1,306 the headline is glaringly inaccurate. The only way that benzodiazepines are as lethal is if they are mixed with opioids - a fairly common occurrence. That is not a combination prescribed by psychiatrists. The overwhelming number of deaths due to drug overdose are from opioids - 33,091/year. These combinations have been studied in persons on maintenance opioids (methadone and buprenorphine) who are also prescribed benzodiazepines, sedative hypnotics and in a recent study (4) - pregabalin. The authors of that study found that of their sample of 4501 patients - 32.8% were prescribed benzodiazepines, 40.8% z-drugs (zolpidem, zopiclone, eszopiclone, and zaleplon) and 22.2% were prescribed pregabalin. In their study, the pregabalin and z-drug prescriptions were associated with more overdose deaths and the benzodiazepines were associated with more overall deaths. That combination accounts for the common experience of opioid and heroin overdose deaths in small towns across America. Those overdose deaths in small town American were unheard of before the current epidemic. It doesn't hurt to get the facts straight when attempting to throw psychiatrists under the bus, even though in the majority of cases - facts are the last thing any of the critics seem to consider. 3: Kjosavik SR, Ruths S, Hunskaar S. Psychotropic drug use in the Norwegian general population in 2005: data from the Norwegian Prescription Database. Pharmacoepidemiol Drug Saf. 2009 Jul;18(7):572-8. doi: 10.1002/pds.1756. PubMed PMID: 19402032. 4: Abrahamsson T, Berge J, Öjehagen A, Håkansson A. Benzodiazepine, z-drug andpregabalin prescriptions and mortality among patients in opioid maintenance treatment-A nation-wide register-based open cohort study. Drug Alcohol Depend. 2017 May 1;174:58-64. doi: 10.1016/j.drugalcdep.2017.01.013. Epub 2017 Feb 28. PubMed PMID: 28315808. All slides from NIH/NIDA and are assumed to be public domain. "In 1986, Congress enacted the Emergency Medical Treatment & Labor Act (EMTALA) to ensure public access to emergency services regardless of ability to pay. Section 1867 of the Social Security Act imposes specific obligations on Medicare-participating hospitals that offer emergency services to provide a medical screening examination (MSE) when a request is made for examination or treatment for an emergency medical condition (EMC), including active labor, regardless of an individual's ability to pay. Hospitals are then required to provide stabilizing treatment for patients with EMCs. If a hospital is unable to stabilize a patient within its capability, or if the patient requests, an appropriate transfer should be implemented." There are numerous links on the web site about what that all means. From a practical standpoint in many states the law has been disruptive to psychiatric care for persons going to an emergency department with a psychiatric emergency. The law in effect makes it seem like there are plenty of resources to treat anyone with a serious problem, but on the other had the receiving services are seriously rationed. There is no better example than psychiatric services where most hospitals have no inpatient services and practically no hospitals have psychiatrists working in their emergency departments (ED). That results in a triage system based on dangerousness and the two pronged deficiencies of no treatment unless you are dangerous and a frequently contentious determination of dangerousness. Dangerousness here is basically a managed care term to facilitate discharges in patients who have been partially treated and still symptomatic. A person can be determined to be ready for discharge if they are no longer saying that they are having suicidal or aggressive thoughts that day. That means at the time of admission there can be a lot of dishonesty by others to get people in the hospital and in many cases a desperate person who is not able to function will say they are "suicidal" when they are not. The main problem is people who are uncertain for one reason or another and end up on legal holds for psychiatric assessment. In the state of Minnesota that hold is for 72 hours excluding weekends and holidays. The EMTALA law generally creates a massive backlog of patient in the ED waiting to be admitted for psychiatric indications. If they cannot be admitted to the hospital they initially present to, they can be transferred to any hospital in the state. Transfers of several hundred miles are common. The receiving hospital is at a disadvantage because they have no records and any transferred electronic health records (EHR) are typically devoid of useful information. They also no longer have access to psychiatrists who know them and their family has to travel much greater distances to see them. The combination of rationed inpatient services, rationed housing and residential services, and EMTALA basically keeps a large population or partially stabilized people with psychiatric disorders rotating in an out of the ED, inpatient units, shelters, and in many cases local jails. EMTALA makes it seem like politicians are doing something while they are allowing insurance companies to ration services and make money. In health care policy discussions, there has been an excessive focus on ED services. I have heard many people say that we don't need wider access to health care because of EMTALA: "Whether I have any insurance or not - I can always go to the ED and get treated." That is a rather naive statement about the evaluation and treatment of most medical problems. What about the situation where patients have reached American healthcare nirvana and are insured? In this case rather than getting default rationed treatment because of an inadequate system they have the opportunity to receive proactively rationed care for the sake of maintaining their insurance company's profits. To make matters worse quality of care in both scenarios is very poor. Since these scenarios are only obvious to psychiatrists working in either acute care or residential care settings - I will provide a few examples of how being insured works against the patient. The outcomes are factual, the case specifics are not. Case 1: 36 year old man admitted with alcohol use disorder and a recent suicide attempt. He requires detoxification and during that process it is discovered that he is also taking alprazolam 2 mg bars - 4 -5 a day that he acquires off the street. The detoxification is difficult for many reasons with poor response to benzodiazepines and on day 5 the decision is made to change the detox agent to phenobarbital. The patient remains depressed, hopeless, and is non-disclosing about suicide potential despite continuing on high doses of two antidepressants, one of which (venlafaxine ER 150 mg/day) was effective prior to escalating alcohol and benzodiazepine use. A managed care company reviewer calls on day 3 and 4 and says the patient must be discharged by day 5. When provided with the new data about the change in detox protocol - he says the patient can take the medication with him and complete it as an outpatient. Case 2: 75 year old man with diabetes mellitus Type II, hypertension, and atrial fibrillation. He has an alcohol use problem but was admitted because of cognitive concerns and declining cognitive function. The family doubts that he is taking any of his ten medications accurately due to the cognitive problems. They are also concerned about the number of empty vodka bottles found at his home and the fact that he has numerous firearms. The managed care company reviewer calls the day after admission and states that the patient is not covered because there is no "dangerousness" - translation - he is not making any suicidal remarks or threatening to harm other people. He must leave the hospital or pay for his own treatment. Case 3: 22 year old man with depression and heroin addiction. He was dropped off outside the ED following an accidental overdose. The ED staff are familiar with the patient because this is the fifth overdose he has had in the last 3 months all from excessive use of intravenous heroin. During the interview he says: "Look I am not trying to kill myself, I just get to the point when I am trying to get high that I don't care if I live or die." The plan is to detox the patient and get him on buprenorphine-naloxone in a controlled setting to reduce the risk of another overdose and provide the additional counseling necessary to do that. The managed care reviewer calls on day 2 and says the patient must be discharged and the buprenorphine-naloxone can be started on an outpatient basis. These are a few of the many examples of people with insurance who are denied emergency psychiatric care based on the subjective impression of a managed care reviewer. The reviewer has clear conflict of interest since they are charged with saving the company money. In all of the examples there is a clear need for the patient to be in a protected environment until effective and maintenance treatment can be established. There is a clear need for the patient to be detoxed on an inpatient unit. Why would anyone think that giving a large supply of addictive medications to a person with an addiction to managed their own detox would be a good idea? In all cases the managed care reviewer does not care. There used to be an appeal process, but it was to another reviewer hired by the same company. There is no appeal to anyone who is neutral and there has not been for 20 years. The system has worsened in the past ten years. Now the hospitals being reviewed by these managed care companies have their own internal case managers who pressure physicians to make the same low quality decisions. The result is clear. Very poor quality of care. Burned out physicians scrambling to pull together very shaky discharge plans for unstable patients. Politicians and regulators making it seem like they are doing something and bragging how they are improving access and quality of care while containing costs. 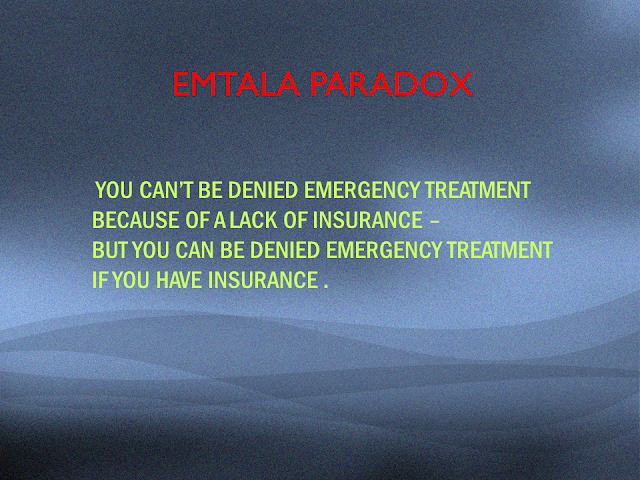 That is the real product of the EMTALA paradox.